ORLANDO, FL--(Marketwire - February 8, 2010) - Full Swing Golf, manufacturer and distributor of premium golf simulators, has been busy during this downturn in the economy. When many companies are struggling to keep the numbers out of the red, Full Swing actually increased their research and development, forged new relationships, and created new ways to bring indoor golf to more people around the world. Enter the 2010 PGA Merchandise Show, held annually in the Orange County Convention Center, just across the freeway from Walt Disney World. Arguably the world's premier golf trade show, every facet of the golf industry is showcased during the 3 day event -- from GPS guided golf carts to the latest in golf range tee design. Full Swing Golf used this occasion to bring its entire family of employees, international distributors, and partners together to discuss their one common vision... that utilizing an indoor golf simulator is a great way to grow the game of golf. As the dialogue ensued between the various representatives from the Americas, Asia, and Europe, one fact became abundantly clear -- that the massive booth in which they were conversing was a testament to the seriousness of their purpose. Upon entering the 4400 square foot space, it had the feeling of an interactive mall, with simulator after simulator lining a corridor that lead to a 40 foot long mobile clubhouse. In each direction was a bay with the latest in virtual golf innovations. The first bay, a custom designed home theater-style simulator, entertained an emphatic crowd that cheered on several Long Drive competitors as they attempted to out distance one another. Another golf simulator, facing the main thoroughfare, was home to a pair of innovations developed over the past year by the company that drove home the new reality of virtual golf. A single camera, designed to directly measure the ballistic spin of the golf ball, adds crucial exact measurements to complex algorithms designed to control the flight of a virtual golf ball. Translation... Golfers were working the ball, mimicking real-life outdoor shots with acceptance on their faces as they stepped out of the simulator. The other showcased feature in this bay was a bit hard to comprehend at first, seeming to defy the laws of physics. It's called the Bounceless Pass Thru Screen. The real ball is struck and it continues to the screen, but instead of bouncing off of it, it passes directly through the screen and on to the other side -- without disturbing the beautiful course. "The Pass Thru Screen is a patented item that is groundbreaking. As your ball hits the screen, it goes through and basically just disappears. It really enhances the indoor (golf) experience," says Brian Arnold, President of Full Swing Golf. Traveling through the bustling exhibit to the other end were a couple of impressive new products that are suited for the traveling golfer, entrepreneurs, PGA Professionals, or corporate hospitality. The Newport Portable Simulator is a compact simulator solution that folds up into the size of a large suitcase. Weighing a mere 175 pounds, it can be set up in under 30 minutes. Among some of the impressive features were a large screen, stunning course graphics, and ball flight accuracy that seemed to please every golfer that stepped on for a test drive. The back end of the booth boasted a 40 foot mobile clubhouse on wheels with a simulator built into the side. Franchising opportunities for this unique traveling golf club were being advertised, as a long line of golfers stepped in and took a shot at winning a free Newport Simulator in a closest-to-the-hole competition. The winner knocked a golf ball 9" from the hole on the second day of the show. Full Swing Golf is making an effort to drive indoor golf to a wider range of people around the world. By developing innovative technologies, more accessibility, and advancements in the overall realness of the sport, the game of golf can only prosper from a new generation of enthusiasts who embrace what Full Swing is delivering. Full Swing Golf shows off its latest golf simulator innovations at the 2010 PGA Merchandise Show. 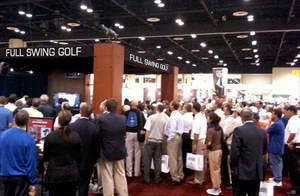 A crowd gathers around a Full Swing Golf simulator at the PGA Merchandise Show.